Partnerships - One of the more common of these are private limited liability corporations (LLC). An LLC might also be used as the legal entity for an investment fund such as a hedge fund (see below) or a private family investment fund, a business, or real estate and resource based (e.g. oil/gas) properties (see below). Properties Partnership - Many properties based partnerships will have the requirement to provide and accounting of rents and expenses as will as provision for tracking "calls" on partners for funding payments at designated points in time. Trusts - A trust entity may have multiple beneficiaries, typically the members of a family. The investments held by the trust will be typically managed in a co-mingled fashion, but there is a need to identify ownership and income individually by beneficiary. Often trusts specify constraints on distributions with respect to investment principal and income, so this is an additional accounting requirement. Hedge Funds - These can be one of various forms of limited partnerships, with the fund manager being the general partner, typically charging the fund asset based management fees and profit based incentive fees. More complex investments and a higher trading rate is typical, and investors must be "qualified investors" due to lower SEC oversight compared to mutual funds. 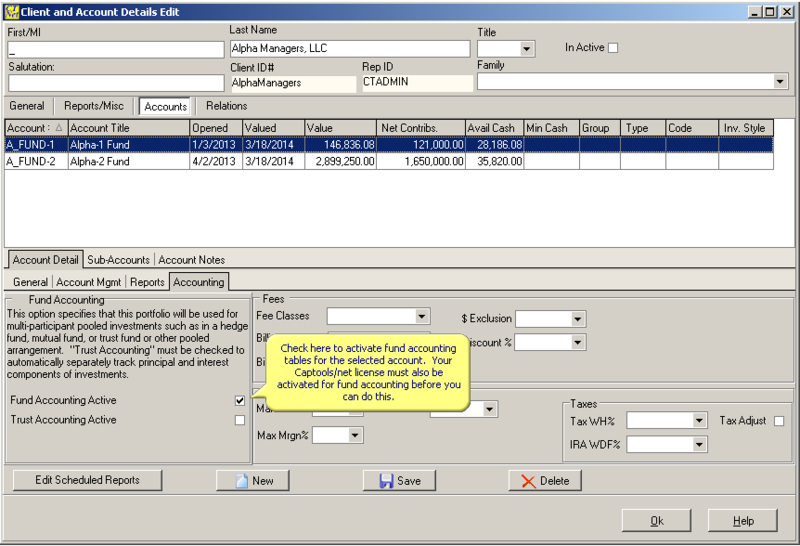 Captools/net accounts for fund partner or participant equity and share of profits and losses using the "aggregate" method. This is the methodology commonly used for most mutual funds. This means that a participant "buying" into the fund gains a proportional share of all current investments priced at the fund "NAV" (net asset value/share) at the time they buy in, subject to entry fees and commissions. The reverse is true at the time a participant liquidates, also subject to exit fees and commissions. Accumulated income such as dividends, interest and realized capital gains are distributed to current participants at the time of the distribution, pro-rated by share of the fund. Participant share of the fund is accounted for by pseudo-shares, including fractional-shares with user specifiable precision, but may also be reported in percentage format, and may be optionally reported as adjusted "actual shares" where a fund share "ceiling" has been imposed based upon the funds legal registration (i.e. some states have a lower registration fee on funds if outstanding shares are less than a certain level). 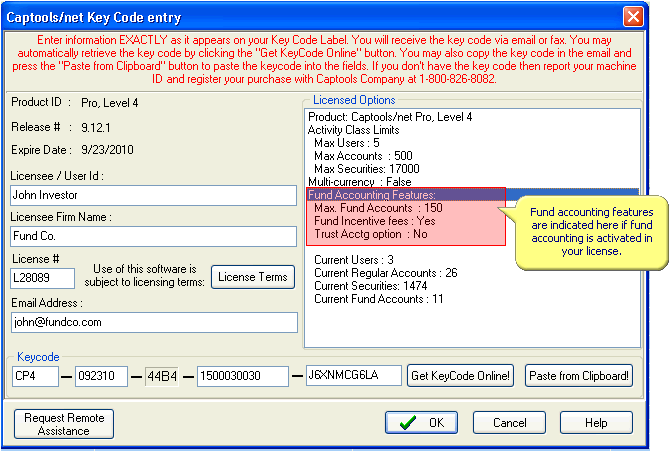 For funds subject to fees imposed by the general partner, both asset-based and incentive fees are computed and reportable on a per participant level. Allowance is also made for fee discounts for some partners, e.g. partners who joined at the founding of the fund. The shares of the general partner and discount fee rate partners are protected via share adjustment from NAV dilution resulting from monies withdrawn from the fund for fees. Fee transaction frequency is user specifiable, and fee accrual is reportable and taken into account in individual partner performance computations.